On a vacation trip, I had a morning to kill in Atlanta before catching my plane, and a friend suggested we visit the Jimmy Carter Presidential Museum. Sounded good. I always admired Carter, and even many of his detractors admit he is one of the most admirable past-presidents, spending his time on good works, rather than enriching himself with large lecture fees. Carter also understood the importance of a well-thought-out energy policy to US security and prosperity, and although his cardigan-wearing fireside chat encouraging Americans to conserve electricity and other forms of energy was widely mocked, it was obvious good advice. 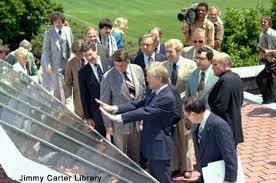 Carter installed solar panels on the White House, which I thought was a pretty good idea, and there was an exhibit at the museum showing Carter explaining to reporters how they worked. This wasn’t just show: Carter was trained in physics and engineering, and actually knew how the things worked (in addition to being one of the few recent presidents who could pronounce “nuclear” correctly). So imagine my delight to see this article reporting that once again, solar panels were returning to the White House. Carter installed 32 panels in 1979. Reagan, believing that the free market, rather than government, should solve problems like the energy crisis, ordered them taken down almost immediately upon taking office in 1981. They got around to removing Carter’s panels in 1986, when some other work was being done at the White House . Both acts were largely symbolic, as 32 panels aren’t going to produce all that much electricity or heat all that much water. The White House panels themselves were “recycled” to Unity College in Maine, where they have been quietly heating water. In another symbolic show, Bill McKibben (350.org) and a group of Unity students brought the panels back to the White House in 2010, asking the president to reinstall them. Now, apparently, panels are going back up. Obama has pledged to install 20 to 50 new panels. As I was reading up on this, I was delighted to read that the George W. Bush administration had actually installed solar panels on White House grounds—though not on the White House itself. Commendable, indeed. As it happens, W is a pretty green guy in some ways, and his house in Crawford is a model in many ways of smart energy use. Proving again that it isn’t impossible to be a card-carrying Republican (who carries more cards than an ex-President?) and exhibit green sensibilities.